Edelbrock Nitrous System - Carb & Plate - Performer RPM II - Dezod Motorsports Inc - Home of the automotive performance enthusiast since 2002. Performer RPM II Nitrous Carb/Plate Systems are available in single or dual-stage configurations for power gains from 200 to 400+ horsepower. Using stainless steel spray bars rather than standard brass for maximum durability, these systems also utilize our Victor Pro fuel solenoids and Victor Pro bottom discharge nitrous solenoids for enhanced flow capacity. 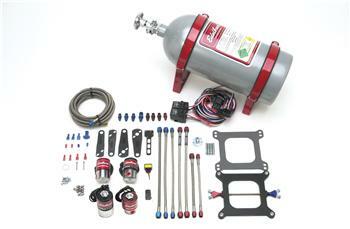 Performer RPM II single-stage nitrous systems are designed for use on carbureted V8 engines. They feature Victor Pro fuel solenoids and Victor Pro bottom discharge nitrous solenoids for enhanced flow capacity. Power increases can be adjusted from 200-400+ horsepower. The 1/2” thick aluminum spray bar plate fits between the carburetor and the intake manifold and features stainless steel spray bars with more discharge holes than Performer RPM systems for more flow and superior atomization. Performer RPM II Nitrous Carb/Plate Systems are available in single- or dual-stage configurations for power gains from 100 to 400+ horsepower. Using stainless steel spray bars rather than standard brass for maximum durability, this dual-stage system utilizes our Performer RPM nitrous and fuel solenoids for the first stage and Victor Pro Fuel solenoid and Victor Pro bottom discharge nitrous solenoid for enhanced flow on the second stage. Performer RPM II Dual-Stage Nitrous Systems are designed for those who want to add power in stages to soften the “hit” of the nitrous system. This is one of the best ways to control excessive tire spin or violent chassis reaction. Performer RPM Dual-Stage Systems allow you to tune the first stage to supply 100-200 additional horsepower, then switch to the second stage for 200-400+ horsepower.